Movistar Yamaha MotoGP riders Jorge Lorenzo and Valentino Rossi had a positive start to the first free practice sessions at the Circuit Of The Americas (COTA) today.Having wrapped up the weekend in Argentina less than a week ago, Movistar Yamaha MotoGP’s Jorge Lorenzo was fast from the start of this morning session dropping competitive laps throughout the morning session, but struggled to produce the same form in the afternoon when encountered issues with his first bike and ended the day in fifth place.The opposite was true for teammate Valentino Rossi, who was looking for a better feeling on his bike in the morning, but persisted to work hard on his YZR-M1’s setting for Sunday’s Grand Prix of the Americas and ended the day in sixth position. Lorenzo started the first session with a strong determination to hit the ground running and did just that. 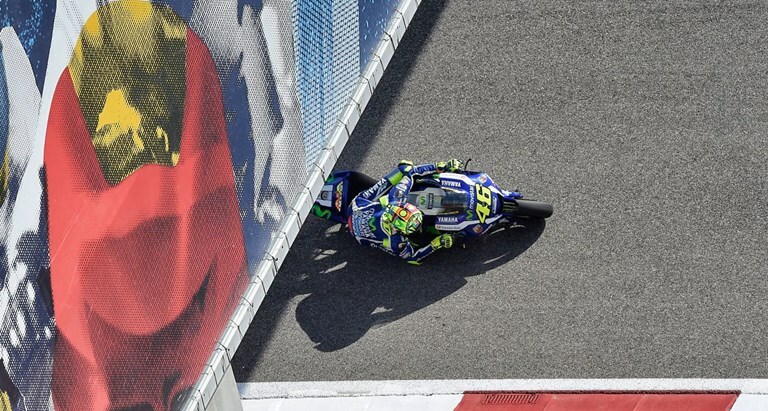 He found a good pace from the beginning of the session and needed minimal tweaking to the setting of his YZR-M1 to match the hard-acceleration character of COTA. Clearly feeling at ease on his bike, he ended the morning session in second place with a best time of 2’05.208s, 0.255s from the front. The Spaniard continued his form in the afternoon practice, which saw him look competitive again when he dropped under the 2’05 mark and climbed up in the rankings. He gradually upping his pace, but was held back when he had some issues with his first bike. Yet he still ended the day within a second off the fastest times and concluded the afternoon session in sixth place with a best lap of 2’04.901s. Teammate Rossi also had a solid start to the Americas GP, setting the provisional third fastest lap. He then moved his attention towards bettering the rear tyre performance. His best time of 2’06.252s saw him finish seventh in the morning rankings, but the day was far from over. The Doctor continued to work on his YZR-M1’s setting in the afternoon and saw results straight away when he set the provisional fastest lap, less than ten minutes into the session. He kept up his competitive pace for the remaining 35 minutes, but was pushed down to sixth place towards in the final stages of FP2, despite setting multiple fastest times in first and second sector, when the pace picked up. Today’s results put Lorenzo fifth in the combined free practice time sheets and Rossi in sixth. Monster Yamaha Tech3 team rider Pol Espargaro embarked on his round three campaign with a run to 13th on the opening day of action in Texas. The Spanish star leapt into gear when FP1 commenced and began setting up his Yamaha YZR-M1 for Sunday’s race. He closed the session in 12th and when the afternoon practice started, he carried on his solid efforts before posting a personal best on his final lap. This time left him just over six tenths from the Factory Yamaha riders and leaves him optimistic of sealing a top grid position tomorrow. On the opposite side of the pit box, Bradley Smith pushed throughout the day at the Circuit of The Americas as he adjusted the setup of his MotoGP bike to suit the meandering track. After making steps forward in the morning, he got straight back to work in FP2 and progressed by setting a lap time that was 1.019 quicker than his best from the opening session. Now, the Briton is fully focused on bouncing back tomorrow with his sights firmly set on seizing a strong qualifying result.